"In all the investigated sites, we saw evidence of leaking," said Avner Vengosh, a professor of geochemistry and water quality in Duke University's Nicholas School of the Environment. "Some of the impacted water had high levels of contaminants." During the summer and fall of 2015, the team sampled 39 surface water and seep samples from coal ash ponds at seven sites. They also analyzed water chemistry data from 156 shallow groundwater monitoring wells near coal ash ponds at 14 North Carolina power plants that had been compiled by the state's Department of Environmental Quality. Shallow wells -- typically 30- to 50-feet deep -- are not as deep as a drinking water well, which might be 100 to 300 feet. But there's a potential the shallower contamination could flow deeper and affect drinking wells, Vengosh said. "The degree to which leakage affects the concentration of toxins in nearby waters varies because of several factors, including the nature of the coal ash, processes in the pond and the flow through the local soil," said Jennie Harkness, a Ph.D. student at the Nicholas School and the lead author of this study. While it is legally permitted for some coal ash ponds to release liquid effluents to nearby surface waters through regulated outfalls, the new data show that these ponds are also leaking in unpermitted ways. "Coal ash ponds pose risks to the environment and water resources," Vengosh said. 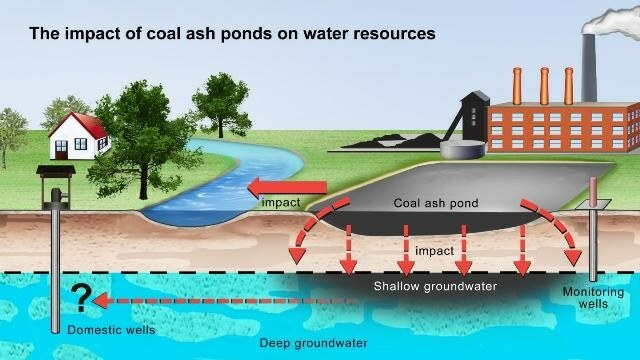 Vengosh said it is reasonable to conclude from these findings that physically removing the coal ash ponds would leave "a legacy of contamination. You would still have a major issue to address the subsurface groundwater contamination. After decades of leaking, the impact has already happened."